Florida Georgia Line and Sheryl Crow teamed up to announce the 47th Annual CMA Awards nominations on ABC’s Good Morning America live from Times Square earlier today (9/10). NASHVILLE, TN (September 10, 2013) – Florida Georgia Line is turning up the triple play action this week with “Round Here” earning their third consecutive #1 smash in both the US and Canada. The GOLD-certified single topped all four Country radio charts – Mediabase Country Chart, Billboard Country Chart, Mediabase Canada Country Airplay Chart and BDS Canada Country Airplay Chart. Amassing international appeal, the breakout duo recently crossed a new career threshold — tallying more than 10 million tracks sold worldwide from their debut album HERE’S TO THE GOOD TIMES (Republic Nashville), which has been certified PLATINUM in the US and GOLD in Canada. As announced earlier today (9/10), FGL earned their first ever Country Music Association (CMA) Award nominations and scored nods in the following four categories — Vocal Duo; New Artist of the Year; Single of the Year for “Cruise”; and Musical Event of the Year with Nelly for the remix of “Cruise.” The awards show will air LIVE from the Bridgestone Arena in Nashville on November 6 at 8P ET/PT on ABC. 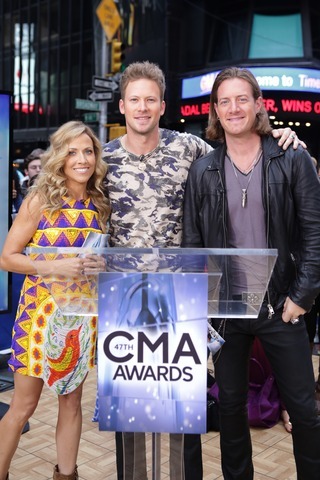 “Last year we attended the CMA Awards for the first time and now to be nominated for four awards is an unbelievable honor,” shares FGL’s Tyler Hubbard (Monroe, GA). The hot newcomers previously garnered back-to-back, multi-week #1 smashes in the US and Canada – the 5X PLATINUM breakout debut single “Cruise,” which combined with the remix with Nelly has sold over 5.5 million copies in the US alone, and PLATINUM-certified follow-up “Get Your Shine On.” According to SoundScan, “Cruise” is the third-best-selling Country digital song ever and recently broke the record for longest #1 on Billboard’s Hot Country Songs Chart. The multiple ACM and CMT Music Award winners will headline the HERE’S TO THE GOOD TIMES TOUR 2013 this fall.